WHAT CAN BE SAID about Bumfights that hasn't already been said before? "Appalling!" "Outrageous!" "Disgusting!" "Just plain fucked up!" - a series that has had been reviled and debated for years. A series that is banned in the UK (customs will certainly nick it if they find it). And one that revels in capturing the depravity, violence and sheer stupidy of the gullible American underclass. Every aspect of Bumfights is objectionable: the exploitation and humilation (and injuring) of drunks and junkies; the violent fist fights; the crime; the kidnapping; the shitting in the street... Bumfights is like a stream of crack-baked consciousness - a relentless document of urban desperation, violence and filth, driven by film-makers who stop at nothing to show us what they see day to day. 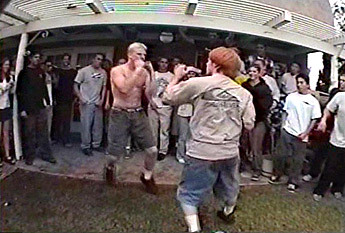 That said, it's hard not to admire Bumfights for pushing the boundaries, and for presenting it in a cutting edge way. Bumfights isn't technically outstanding (the opening titles look like they were made on an Amiga), but the ideas are definitely sharp. The music is very good too - a mixture of hip-hop, punk and metal - giving Bumfights a very unique and raw edge. 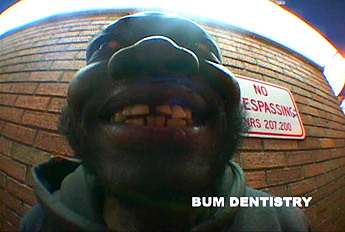 A sense of humour is essential, if you plan on watching Bumfights. It's the only way you could possible glean any entertainment out of it. It might leave you angry; could even make you throw up; but will almost certainly provoke a reaction from you. And for that reason alone is worth a viewing. It's easy to see why this film is so reviled. It's astonishing in places. Once I got over the initial shock though I saw the funny side and have loved it ever since. Why not let these idiots slug it out? It shows us just how stupid they are, and we have a good laugh at their expense. The Bumhunter is completely out of line, and great viewing for that very reason! And the guy who plays him gets it spot on. The fighting I'm not a big fan of, though some of the bouts in this DVD are strangely compelling. 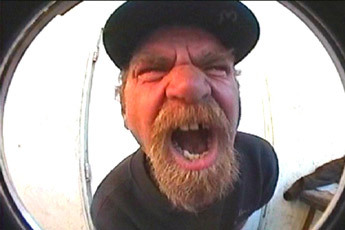 Bumfights is a great party video. Wow, this is true underground art. Love the punk and hip hop soundtrack, and the really wide angle lenses. The guys who made this have a great sense of humour too. Very dark and deeply satirical. For me Bumfights has taken the exploitation film to whole new level.